He was on for the equivalent of one half, Gerard Deulofeu. Roughly 45 minutes in a game that lasted two hours. 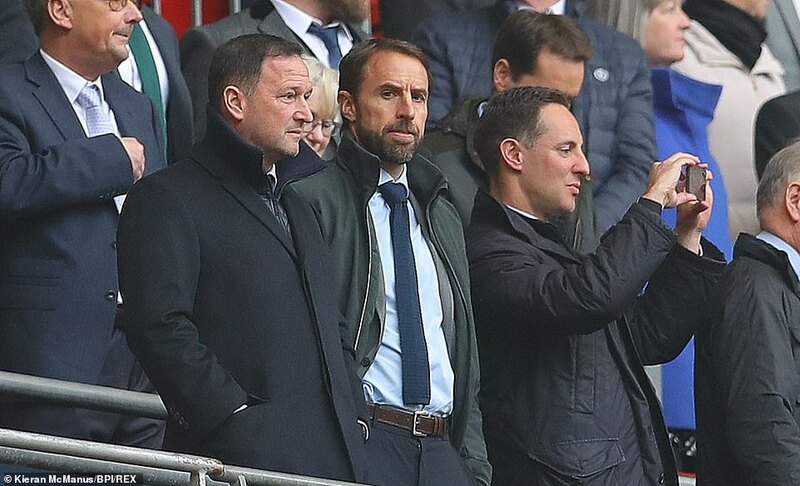 Yet in that spell, he transformed the match, sent Watford to the FA Cup final for the first time since 1984, turned Wolves from comfortable winners into wretched losers. What a performance it was from the substitute. A wonder goal to bring Watford back into the game, an extra time winner to cap the most remarkable comeback. Having arrived after 66 minutes, he left injured before the second-half of extra time was complete – but by then he had done more than enough. 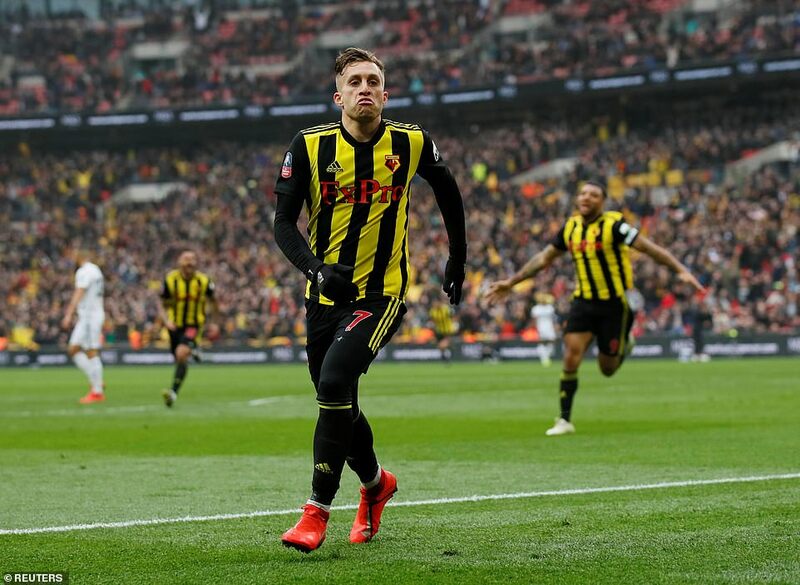 His winner summed up the extraordinary shift that had taken place, Deulofeu skipping through the midfield, exchanging passes with Andre Gray, Wolves, exhausted, dispirited in his wake. Joao Moutinho and Ruben Neves were off by then, and it showed. Wolves looked like beaten men, Deulofeu like he could run forever. The talent has always been there. This, however, must be the career highlight. 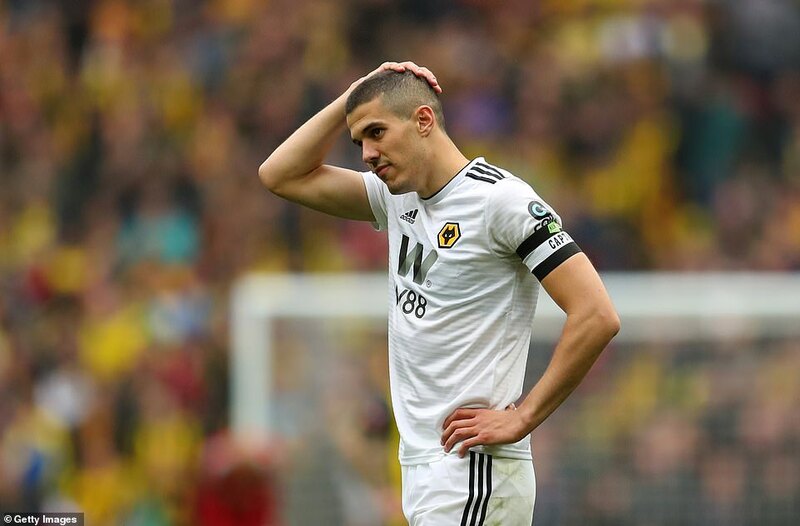 He outstripped Wolves captain Conor Coady and finished smartly. Watford had done it. From, 2-0 down with 11 minutes remaining, they now led. From second best for much of the afternoon, they had crushed Wolves utterly. This was their third shot on target, and a third goal. This was a quite magnificent, gutsy revival. Maybe one day we will tire of the masks that are becoming an increasing part of goal celebrations. What we will never tire of is the type of goals that brought the second-half of this semi-final into wonderful, vibrant life. 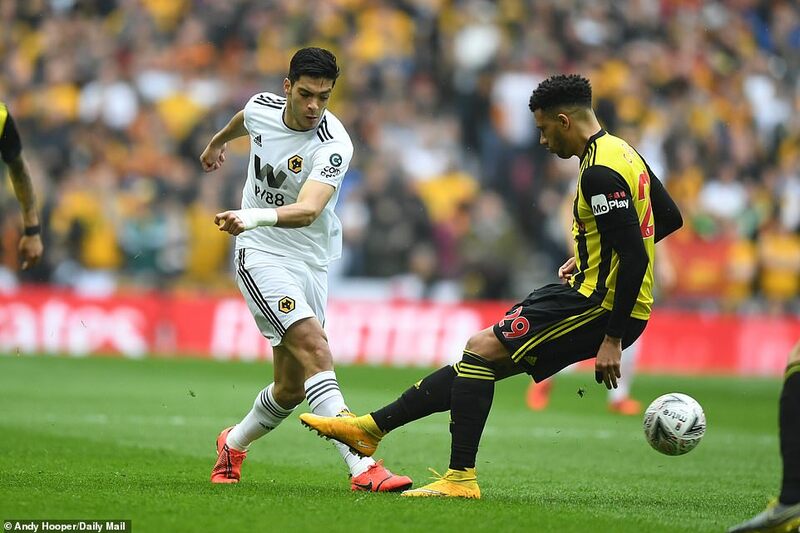 Raul Jimenez was the striker who donned the customised WWE mask to mark what most believed was the goal that sent Wolves into their first FA Cup final since 1960. 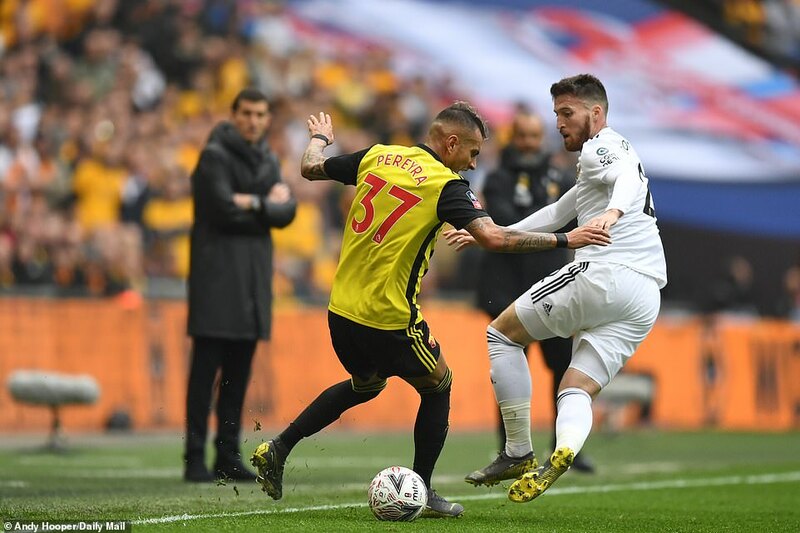 Deulofeu was the adversary who had other ideas, a brilliant 79th minute rejoinder leaving Nuno Espirito Santo’s team clinging onto their lead for dear life, in front of their equally nerve wracked travelling fans. They took up half the stadium but, outside, it seemed like more. 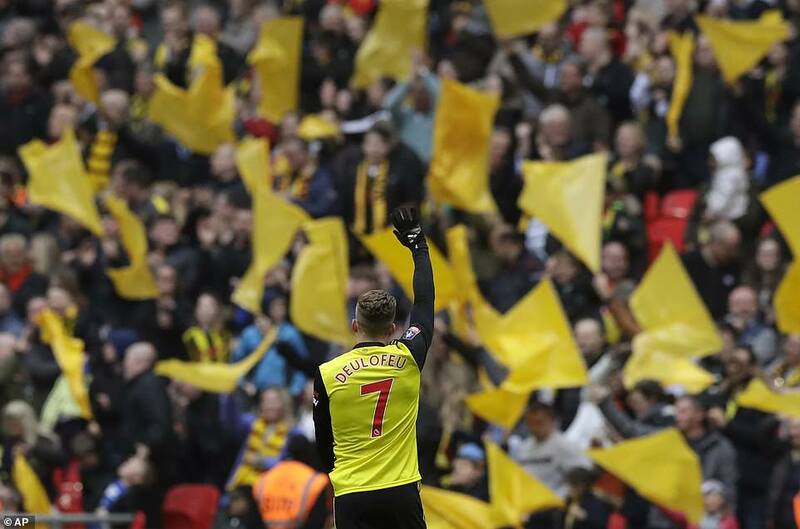 The entire city appeared to have decamped to the capital for the weekend, they made that much noise – and Watford’s loyalists were not far behind. 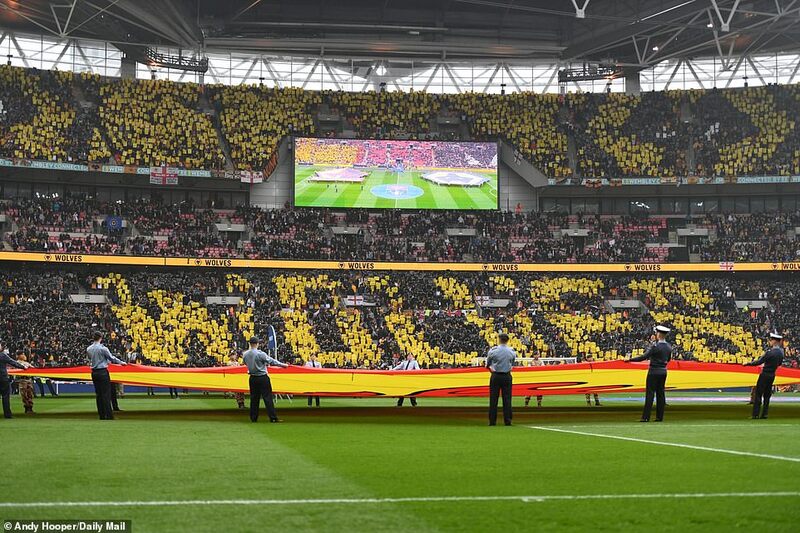 It was a magnificent atmosphere and, eventually, a game to match. The first 45 minutes were unexceptional but the goals in the second-half encapsulated the leap in quality – as did the drama at the end. Goals first. The one that looked to have won it was a peach, and rather fitting to be scored by a Mexican, as Jimenez’s take reminded of nothing more than Gerd Muller against England in Guadalajara in 1970. The same volley, sideways, falling away, with only the goalkeeper to beat. 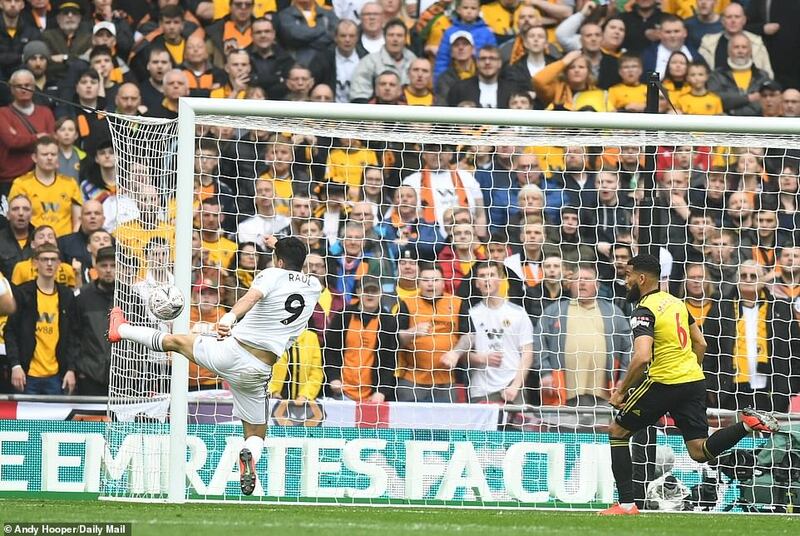 Jimenez did more to make it than Muller, mind – taking Matt Doherty’s cross on his chest sublimely, before letting the ball drop to his shooting foot. 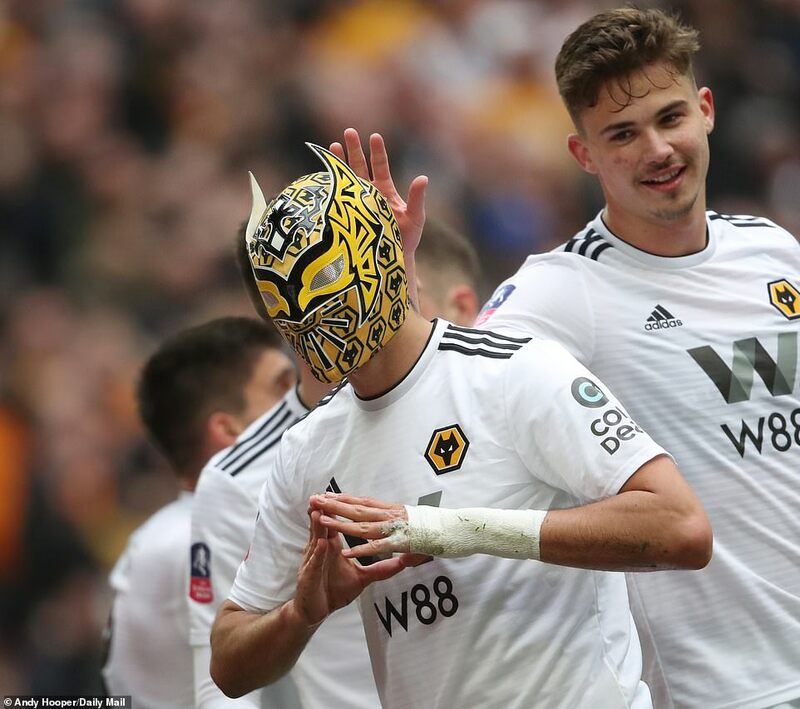 He scampered behind the goal and put on what WWE aficionados will recognise as a Sin Cara mask, except this one had been specially designed to include what looked like the Wolves logo. At which point, referee Michael Oliver signalled that VAR was checking for fouls and offside. Oops. Jimenez would have looked a little foolish in costume with the referee signalling a free-kick to Watford. VAR saw no shadows, however, and the goal stood. 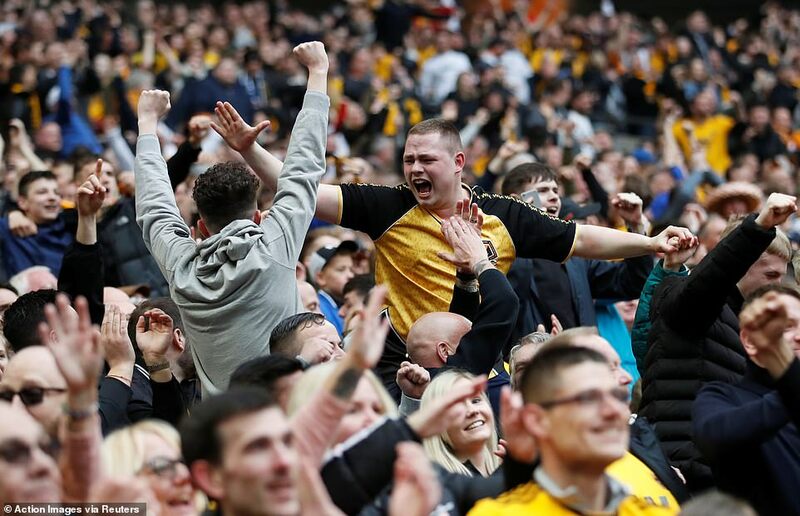 This is the moment Matt Doherty broke the deadlock for Wolves with a header at the back post. CLICK HERE to take a look at our brilliant MATCH ZONE service. 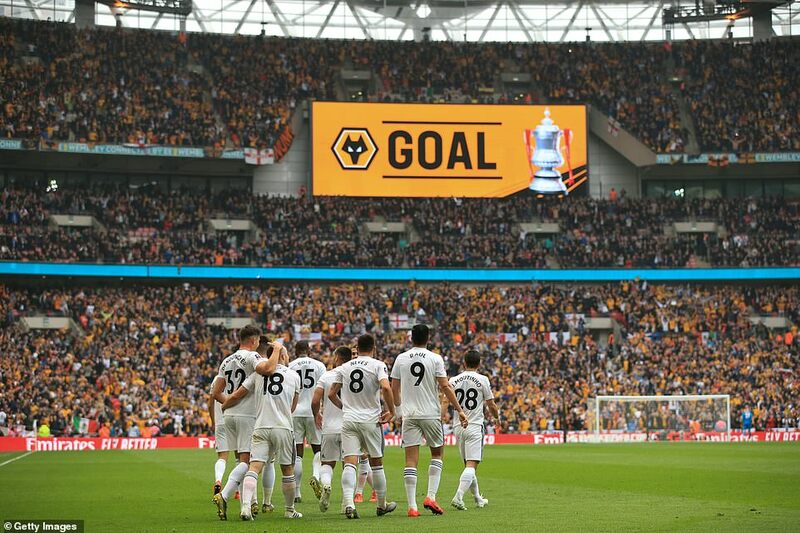 Wolves, it seemed, were going to Wembley – or coming back to Wembley, the Football Association have removed the uniqueness from that journey. Watford had been largely unimpressive. At that point, charged with the consequences of inaction, they sprang into life. Suddenly, Wolves were under siege. 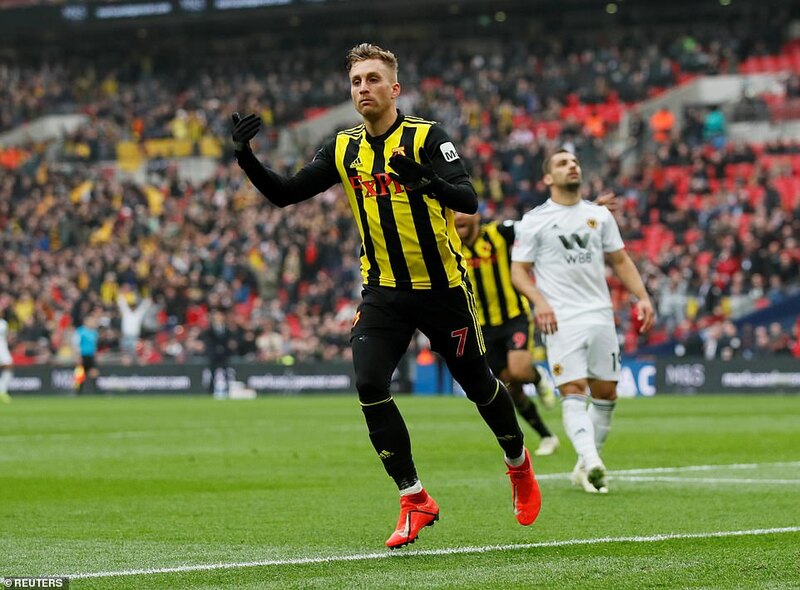 Javi Gracia also introduced Deulofeu to find their weaknesses, and his brilliance turned the 90 minutes. 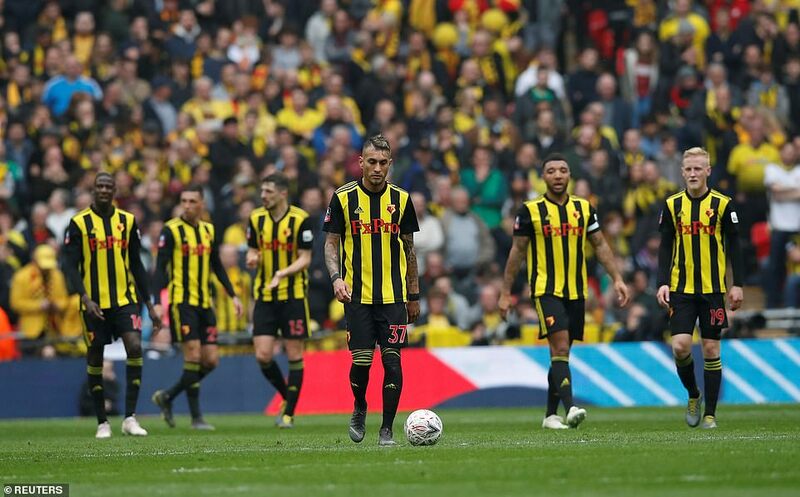 Watford were camped in an around Watford’s penalty area when the ball fell to Deulofeu on the left. Tight angle, 12 yards out but he tamed the challenge stunningly. A curled chip, up and over the crowded area, out of reach of a despairing John Ruddy, in at the far post. Deulofeu’s Catalan heritage is appropriate, because it was the sort of goal one could imagine Lionel Messi scoring; he probably has. From there, Wolves had to hold their nerve, see out normal time; breathe again. They couldn’t. 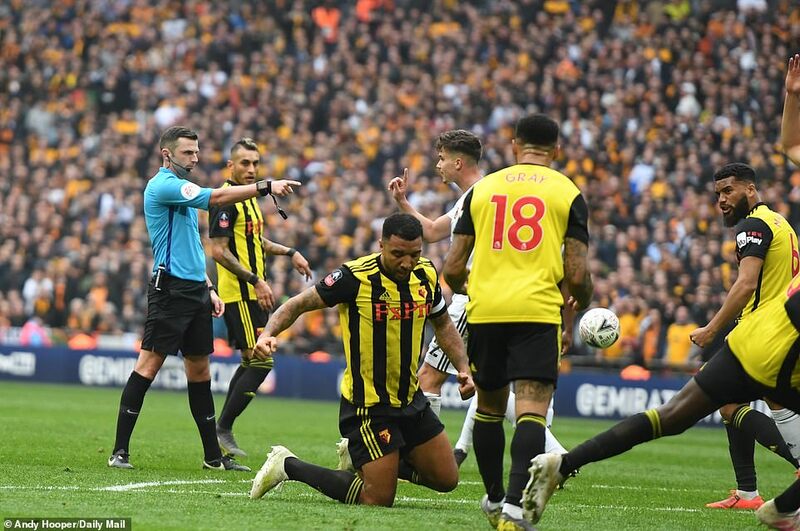 Leander Dendoncker dived in on Troy Deeney, Oliver gave the penalty, VAR agreed. Deeney stepped up and lashed it left. Ruddy guessed correctly but went too soon. The shot was straighter than he imagined and he could not correct. Jimenez may have worn a mask, but it was Watford making out like bandits. It was a noisy, colourful event, and a pity that for long spells of the first-half the action did not live up to that. 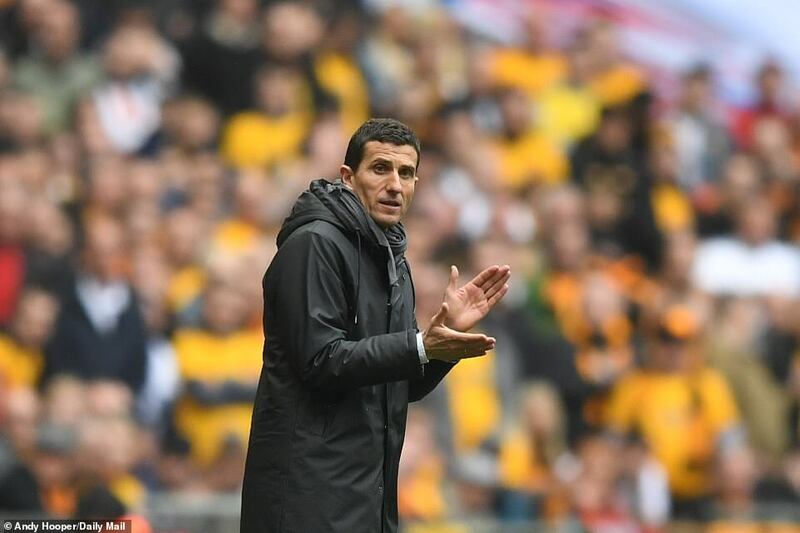 Wolves started brightest, surrendered the initiative to Watford, took the lead and almost let Javi Gracia’s team back in before half-time. 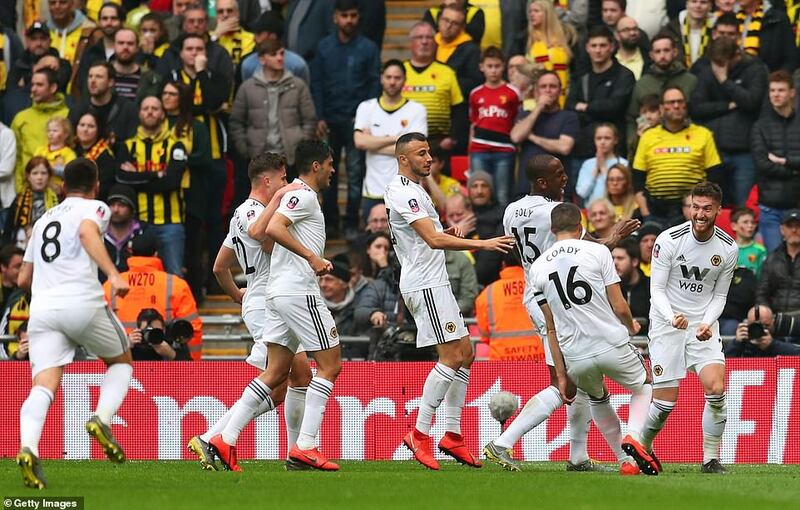 Wolves looked the better team, with a shape and pattern that is instantly recognisable, but Watford forced the best chances of the first-half, both missed by Andre Gray. The first came after 31 minutes, a fine ball in from Troy Deeney, Gray played onside by Wolves captain Conor Coady before volleying over. For the next, in injury time, it was Coady who saved the day. 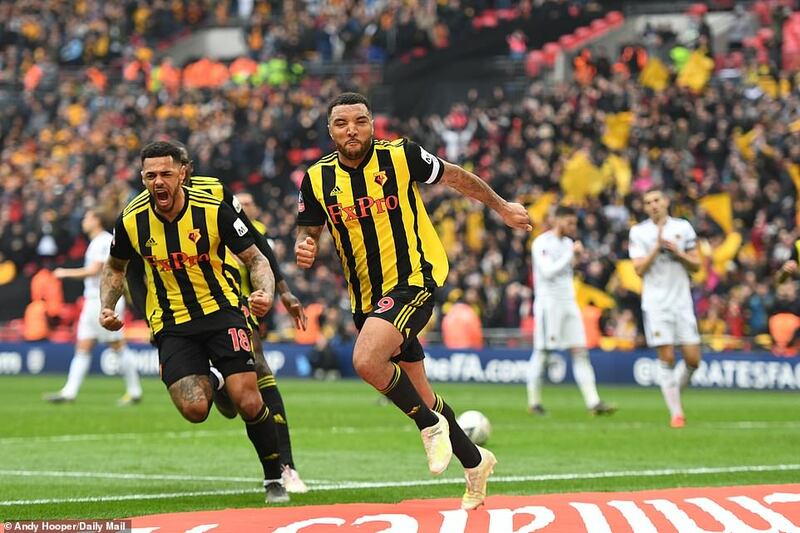 A lofted forward pass was delivered by Will Hughes, the troublesome Deeney got a headed flick on and Gray was free, the goal at his mercy. He took it first time and Coady threw himself at the ball, in the manner of John Terry in his pomp. After he lay flat out, before springing to his feet. 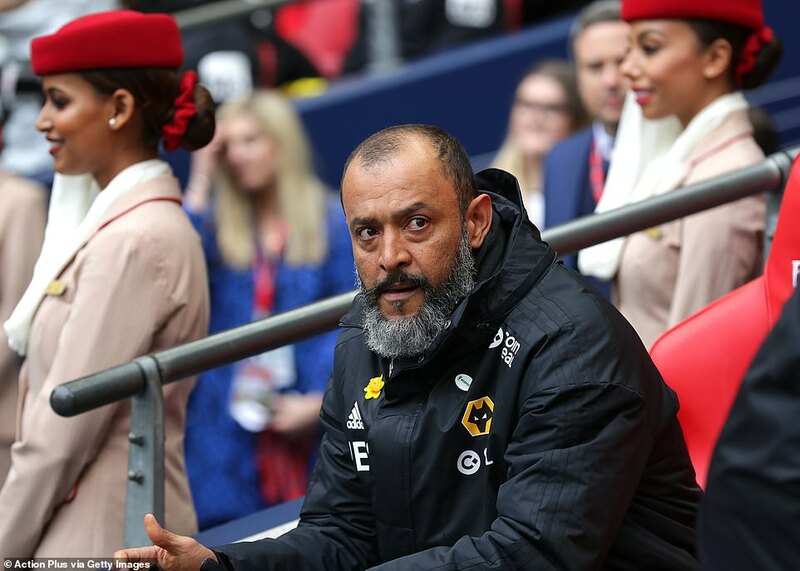 He had conceded a corner, but kept Wolves in the ascendancy. 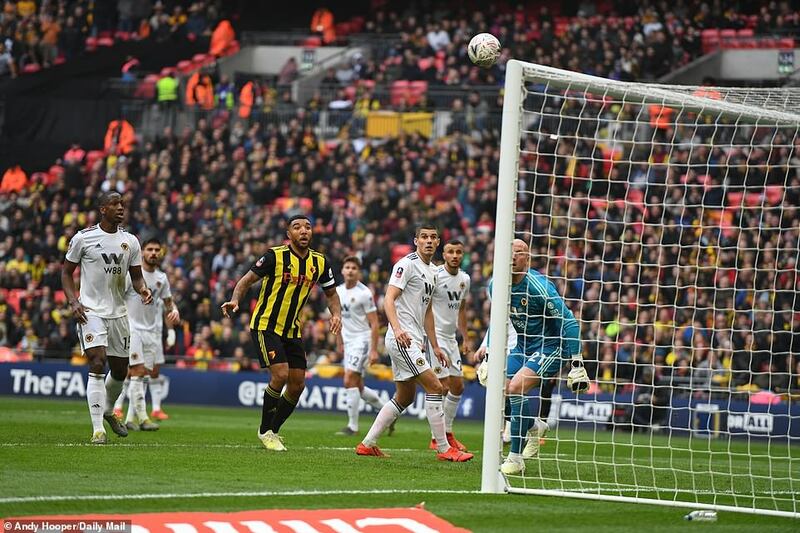 They just about shaded the first-half despite Gray’s chances, putting pressure on Watford inside the first minute when Jonny’s chip flew narrowly wide of the far post. Soon after, a free-kick from Joao Moutinho dipped late and landed on the roof of the net. Dendoncker also fancied his chances from range, a 30-yard shot coming closer than many imagined when he took the decision to go it alone. 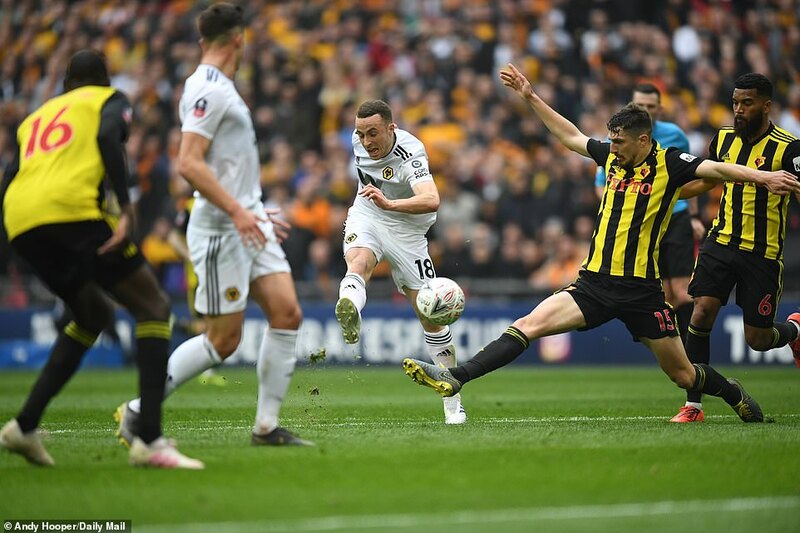 Diogo Jota also tried to test Heurelho Gomes after cutting inside, but could not find his range. 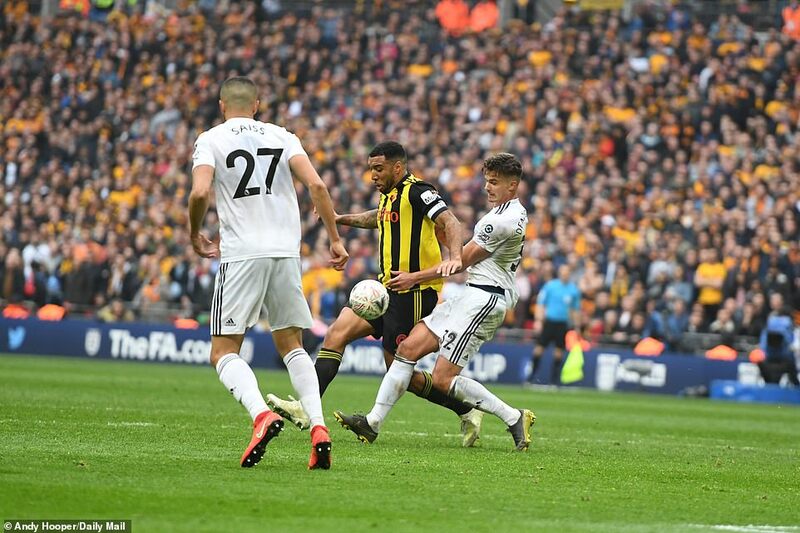 It left a set piece and a Matt Doherty header separating the teams – but the move, like so much of what Wolves do, was perfectly executed. Moutinho took a short corner to Jota, who shaped as if he was going to return the pass but instead changed the angle of delivery. Wolves’ players arrived late, in a stampede, at the far post, and Doherty was unmarked, dropping his head to power the ball past the helpless Gomes.